Da Nang (VNA) - Two more construction projects in coastal Son Tra and Ngu Hanh Son districts of Da Nang have been found discharging untreated wastewater into the city’s household sewage system. The head of the city’s construction department inspection team, Le Van Tuan, said the hotel project of the Vietnam Holiday Company and the Sea Shore Hotel of Chinwin Company had illegally pumped wastewater from their on-going excavation of basement floors into the city’s household waste treatment system. Tuan said the wastewater from these projects would pollute the popular beaches of Ngu Hanh Son and Son Tra districts. “We asked the two investors to stop discharging wastewater into the city’s sewage system before an assessment of the wastewater at the two sites are approved,” Tuan said. He added that the department will carry out additional inspections of all construction projects in the coastal area. Last week, the 27-storey Royal Era 1 Hotel was caught discharging untreated wastewater from its construction site into My Khe beach. 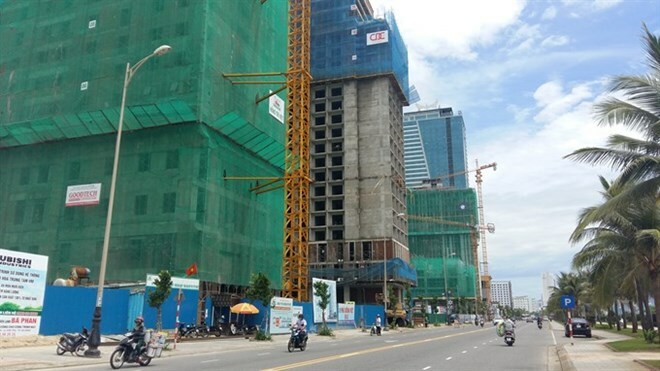 The project investor, TMS Hotel Da Nang Joint Stock Company, was fined 6 million VND (265 USD). According to the latest report by the construction department, seven out of 15 wastewater pipes still discharge untreated household sewage into the sea in Da Nang. Some beaches have been heavily polluted by untreated wastewater from hundreds of seafood restaurants and construction sites along the city beaches.